In 1838 Tithe ownership, Sir John Morris owned the land. *M.S = Mile Stone, see below for more information. Left of the terrace of five buildings including the Mile End became Weig Road. Reproduced from the (1879) Ordnance Survey map, without my reference to the Mile End. P532 KELLY'S DIRECTORY 1891 Fforest fach. Commercial. Clements Susannah (Mrs.), Mile End inn & grocer, Gendros. (LIC) N/A N/A 1908 Susannah Clement was the landlady and owner. 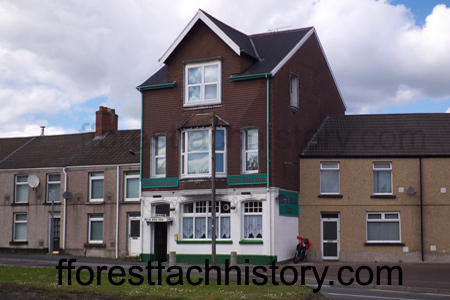 (LIC) N/A N/A 1909 Thomas Isaac was the landlord and Swansea United Brewers were the owners. (LIC) N/A N/A 1926 Oct Trueman, Hanbury and Buxton Brewers were the owners. (LIC) N/A N/A 1946 July Maldwyn Griffith was the landlord and still was in 1962. (LIC) N/A N/A 1962 Maldwyn Griffith was the landlord. (LIC) N/A N/A 1981-2011 Ron Harris was the landlord. The pub closed due to poor business. *Mile Stone is listed on map as (MS) on OS 1899 - This would have existed near the curb of today's house number 678. "'The Travellers' Well', Cwmdu, was then kept by a Mrs. John. 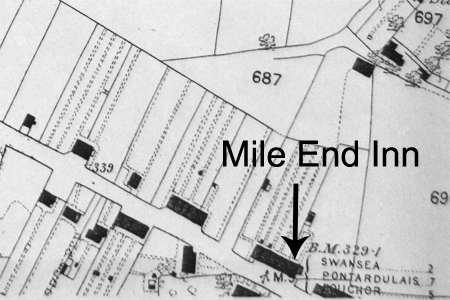 Just above was Vickery Lane named after a nearby farmer; 'Ty Mawr' belonged to a Mr. Davies and further ahead stood Babell Schoolroom (1851) since demolished, and the familiar 'Mile End Inn' run by Wt.Clements." N.L. Thomas, Swansea District and Villages - Fforestfach p.52, printed 1969.